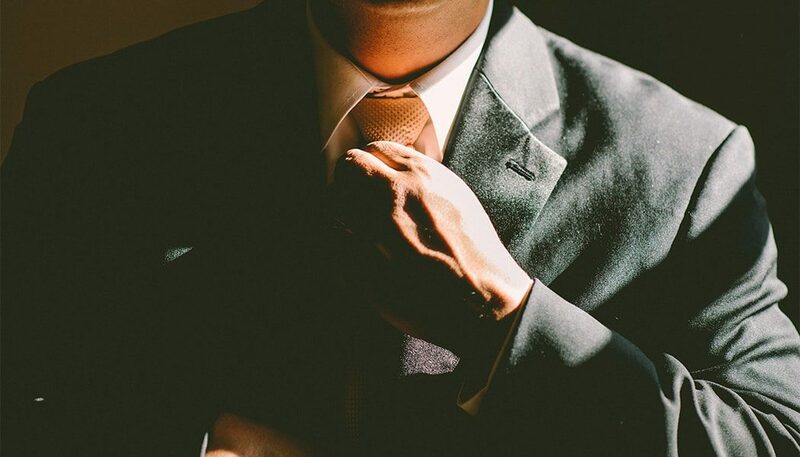 Like it or not when you’re running a business or website people are constantly judging you and you always need to make a good impression. One big and easy to fix mistake we often see people and companies make is using free email services like Hotmail, Yahoo or Gmail for their business. When you hand a potential client a business card and your email is listed as a Hotmail address it looks very unprofessional. On the other hand if your business card has your email address listed as something like yourname@yoursite.com it makes a much better impression. 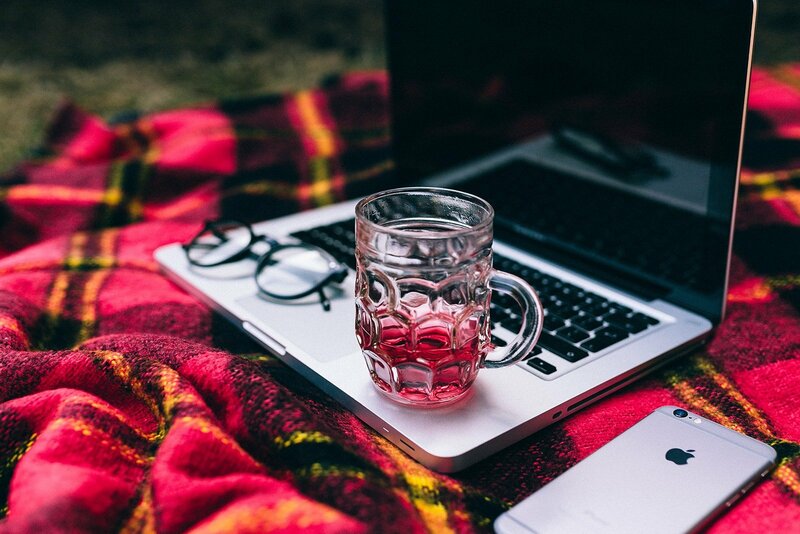 It’s actually much easier to set up an email address with your domain name than you think and one of the many reasons we recommend Bluehost as a web host is because with Bluehost you can create as many email addresses at your domain as you want. Plus you get unlimited space for your inbox if you want too. When you sign up for Bluehost you get to choose a free domain name and you can use that domain for your email addresses. Once you’ve signed up for Bluehost there’s no need to spend money on an expensive email server or email service from any other company. 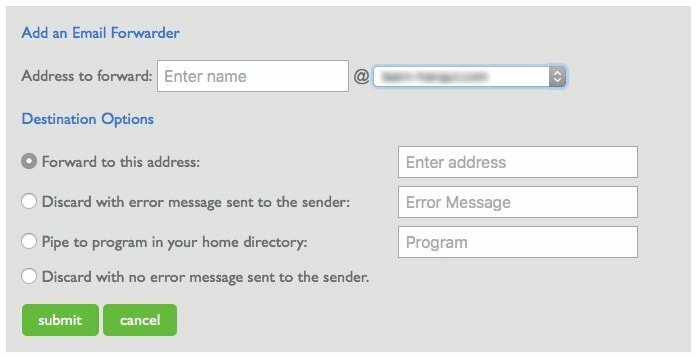 To set up your email addresses first log into your Bluehost control panel and look for the section called email and then click on Email Manager. 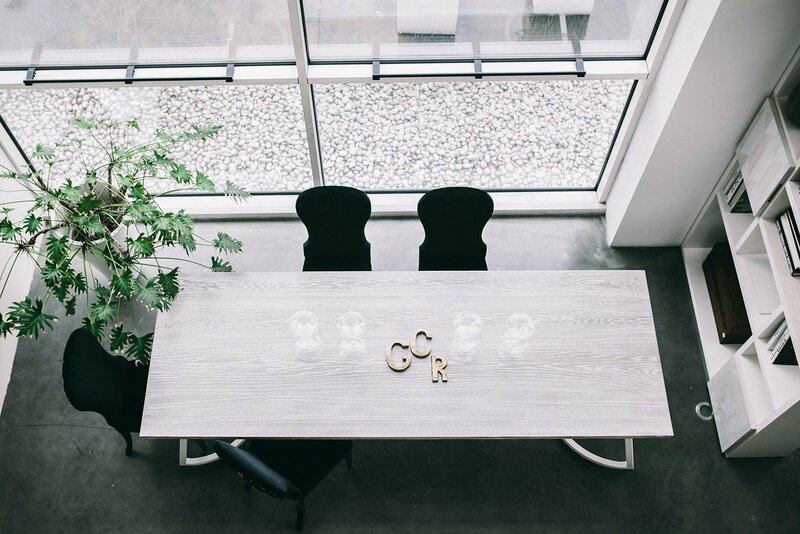 You’ll be taken to a screen where you can set up and manage all your email addresses. To set up a new one click the Create an Email Account button. Next you’ll see this screen where you can set everything up. The first section is where you choose the actual address itself. In the Enter name field you can enter something like your full name, first initial then last name or something generic like contact, support or info. After the @ you’ll see a drop down list of all the domains that are associated with your account. 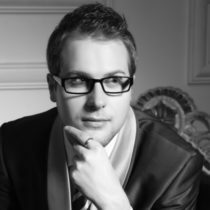 You most likely only have the one domain that you got for free when you signed up. If it isn’t already selected select it from the drop-down or select another address is you have it and want to use it. Next you have to pick a password that meets Bluehost’s strong password criteria. 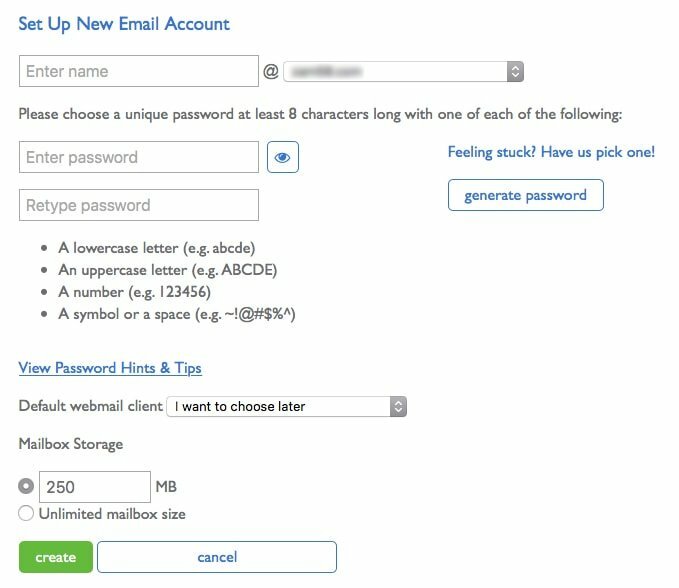 If you want you can click the generate password button and Bluehost will generate a very strong password you can use. This is the password that you’re going to use to log in and check your email later so be sure to write it down some place safe. The last option you have is to select your Mailbox Storage. If you signed up for the Plus plan or higher you have two options, you can set a storage limit or just leave it as unlimited. If you have the option then we don’t see why you’d ever bother to set a limit when you have the option for unlimited email storage space. If you selected the Basic plan when you signed up for Bluehost you’re limited to only 5 email addresses with 100MB of storage each which is still a lot if you’re starting out and just sending text emails back and forth. When you’re good with everything click the green create button at the bottom to officially create the email. You’ll then be taken back to the Manage Email home screen and your new account should show up in the list. Once your email address has been set up your have several options for how to read and send email. 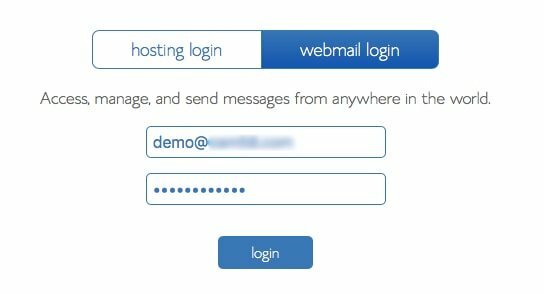 If you click on View Inbox on the above screen it’ll take you to Bluehost’s webmail login page where you can log into your inbox with the address and password you just set up. Here you have 3 different email clients that you can use to access your email. They all function more or less the same, just like any other email client but they look a bit different so you can choose which ever one you prefer to use. As you can see they all look quite different but they all access the same email inbox and they all work more or less the same. 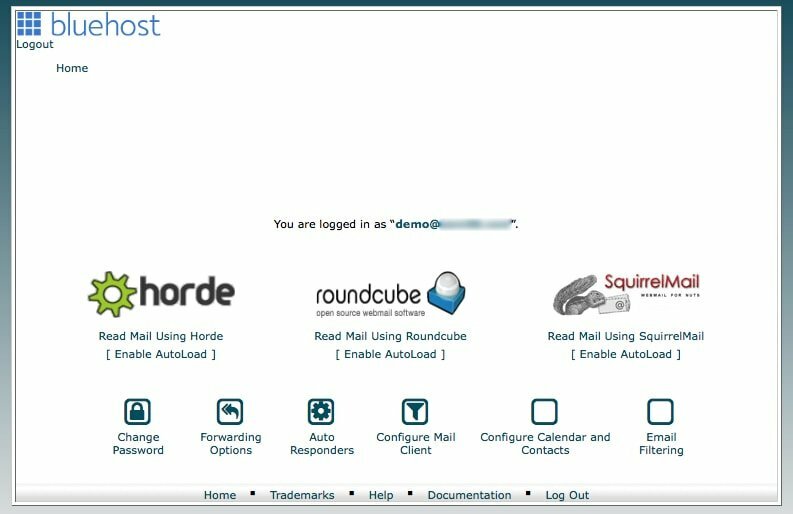 On the screen where you select which webmail client to use you can click on [ Enable Auto Load ] for the one you want and the next time you log in it’ll automatically take you to your inbox skipping that weird client select screen. You can ignore the other settings and options on this screen. They’re all accessible from the Bluehost control panel and easier to use there anyways. Using one of these web mail clients is probably the easiest way to access your email, especially if you don’t have much of a technical background. You can however use an email program like Microsoft Outlook, OSX Mail or Mozilla Thunderbird if you want. 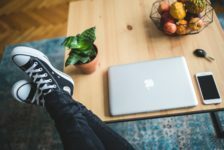 Every email program is going to work a little bit differently and this guide isn’t going to go into too much detail on how to use individual programs. If you run into trouble you can probably find guides to set up new accounts by doing a google search for something like “your email program name + setting up a new account”. Regardless of which email program you use you’re going to need the same information for server addresses and what not. Here’s where you can find it. 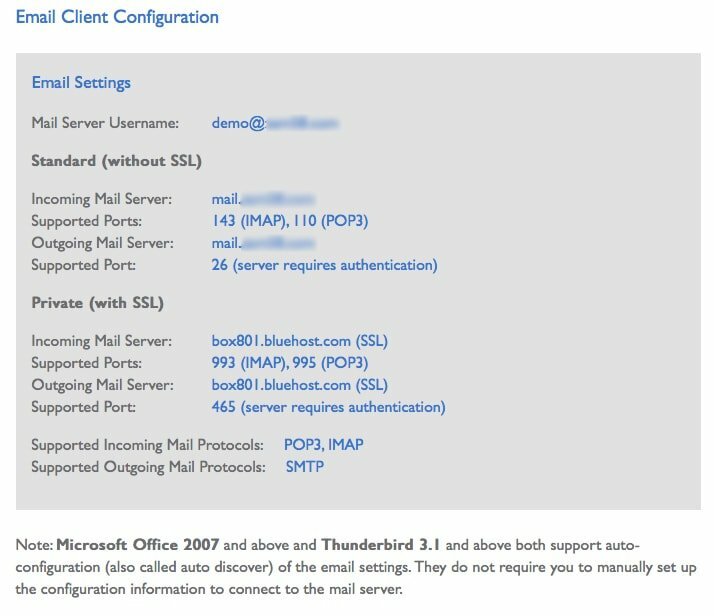 Log back into the Bluehost control panel and click on Manage Email again then click on Email Configuration in the menu on the left. If you only have one email address set up you’ll see the below information. If you have more than one set up already you’ll get a drop down menu to select the one you want. The message at the bottom is saying that if you have a relatively new email program it’ll most likely be able to pull the required settings after you just enter your email address and password. If it can’t and you have to enter everything manually then these are the settings that you’ll enter in your email program to set up the account. Now that you know how to create and use an email address there’s a few other quick things to cover. You can create an email address and have it forward to another one. If you go away on vacation for example and you want to forward your email to a coworker for example. We’ve also seen people who set up an email address at their domain to look professional and just had it forward to their main email address so they don’t have to check two different emails all the time. You have two options here, you can forward one email address to another one or you can forward all the email from one domain to an address. 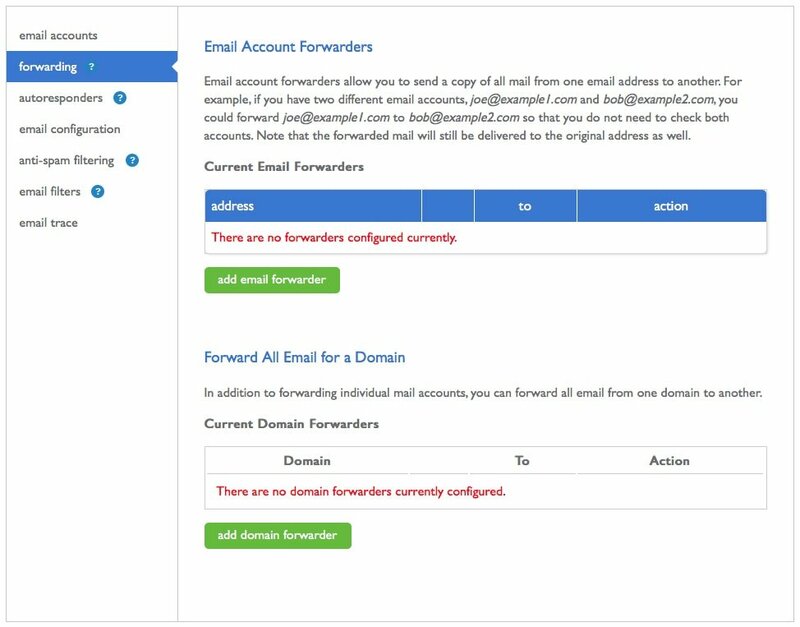 In the address to forward enter the email address you want to forward and make sure the correct domain is selected in the drop-down menu if you have more than one domain on your account. You then have a couple of destination options. Forward to this address simply forwards the email to the address you enter. It will keep a copy of the email in the original inbox. Discard with error message sent to the sender: this will erase any email message you receive and send an error message back to the sender. We’re not sure when you’d want to use this and it’s probably better to set up an auto responder if you want to automatically send a message back. Pipe to program in your home directory: lets you set up a php program to manage emails. You probably have no idea how to do this so you can just ignore this option. Discard with no error message sent to the sender will simply just delete any new mail that you receive. When you’ve got your forwarder set up how you want click the green submit button and it’ll be set up. It’s probably a good idea to send a quick test email to make sure it’s working too. 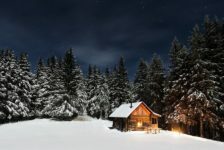 If you’re going to be unable to reply to email for a while if you go on vacation or something like that you can automatically set up an auto responder message that gets sent back to everyone who emails you. 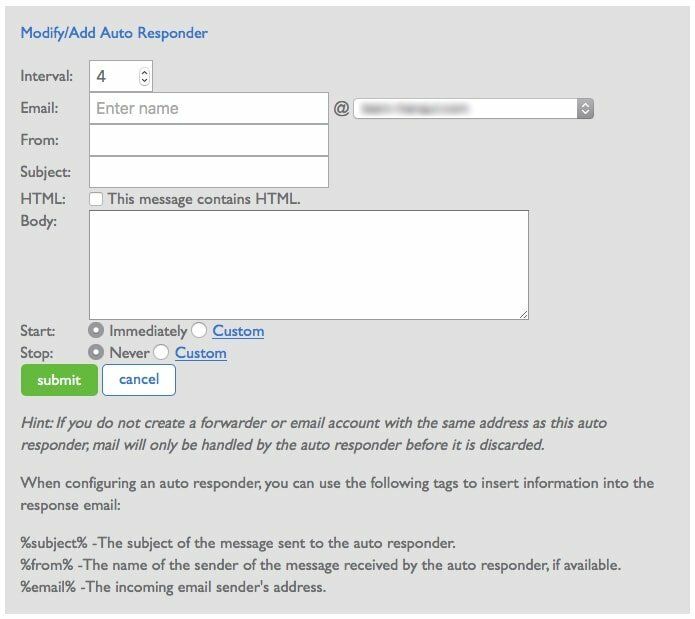 To set up an auto responder message click on auto responders in the left menu on the Manage Email screen. The Interval field is the number of hours to wait before sending out the auto responder email. This is useful incase someone emails you multiple times they won’t suddenly get multiple emails with the same message. The Enter name field is where you enter the name of the email and then select the domain from the drop-down list if you have more than one domain on your account. The From field will be the name that it says the auto responder email is sent from. Subject is simply the subject of the email you’re automatically sending back. If you know some basic HTML code then you can check the This message contains HTML to use HTML code in your auto responder message. The Body field is where you enter the body of your auto responder email. You then have the option to start sending the auto responder message immediately or have it start on a certain date. By default Stop is set to never or you can click on custom to have the message stop sending out on a certain date. When everything is setup click the green submit button and your auto responder will start running. If you want there are three merge fields you can use in the body of your auto responder message. Typing %subject% into your body will pull the subject of the email that was sent to you and include it in the body. %from% will pull the person’s name and include it in your message. You can use this to say something like “Hi person’s name, I’m on vacation now…” and %email% will pull their email address and display it in your auto responder message. That pretty much covers everything you need to know about setting up email addresses. It really just takes a minute to set up and having an email address like support@yoursite.com looks way better than using something like whatever2016@yahoo.com. There are other options you can play around with in the Bluehost control panel for your emails but for now this is all you really need to know. One final thing you need to do though is test everything. If you set up a new email address send it some test emails and send some test replies back. This is especially important if you’re using an email client like Microsoft Outlook. Sometimes you’ll set up your account with the program and the incoming server will be working fine but the outgoing server won’t be. It’s always best to test everything from new accounts to forwarders to auto responder messages before you go live to the public with them just to be safe and so you don’t annoy any potential customers or anything like that.